Once their thorns are removed (or you’ve bought previously de-thorned ones), cactus pads are easy to grill. Grilling them adds a smokey, char flavor to their tangy-sour zing. 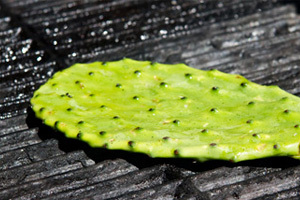 Grilled cactus pads are often sliced into strips (called nopalitos in Spanish) and used in soups, salads, burger toppings, enchiladas, tacos, and more. But of course, they can also be served diced, whole, pureed, etc. 1. Preheat, oil, and clean your grill. 2. Season each cactus pad with salt and a little lime juice. 3. Coat the pads with oil, and add them to the hot grill. 4. Grill on each side until softened and grill marks have developed. 5. If desired, julienne into strips.